Everyone should experience the joy of waking up to a morning like this at least once in their lives! yeah, snow is pretty, I live in Maine so….yeah. but the DOG! My goodness, what a cutie! Gorgeous! Thanks for sharing! My dog is so jealous! I get that all winter long!! It is very serene, I will admit (although seeing it since November, I’m ready for some green!!). Anyway, have some fun in the white stuff! I think it looks really beautiful and I have a similar frosting outside my window this morning. I must say we are more than a bit snow and cold fatigued here in Chicago-we got another inch this morning. I’m ready for spring! BTW, I have a great dane that does the same thing with the snow; she puts her nose down as we walk and lets the snow shovel up over her head. It’s pretty funny. Beautiful and I do love to see this………..in January, but not in March, give me the spring flowers and warm days. I am so ready for spring. In Texas and we had clear skies and 25 degrees this morning, after having a 80 degree day a few days ago. Living in update NY we get to wake up to this kind of thing quite often! And I must say, I don’t tire of it. It’s beautiful and serene and brings the winter birds to the feeder in force! Ima looks adorable! 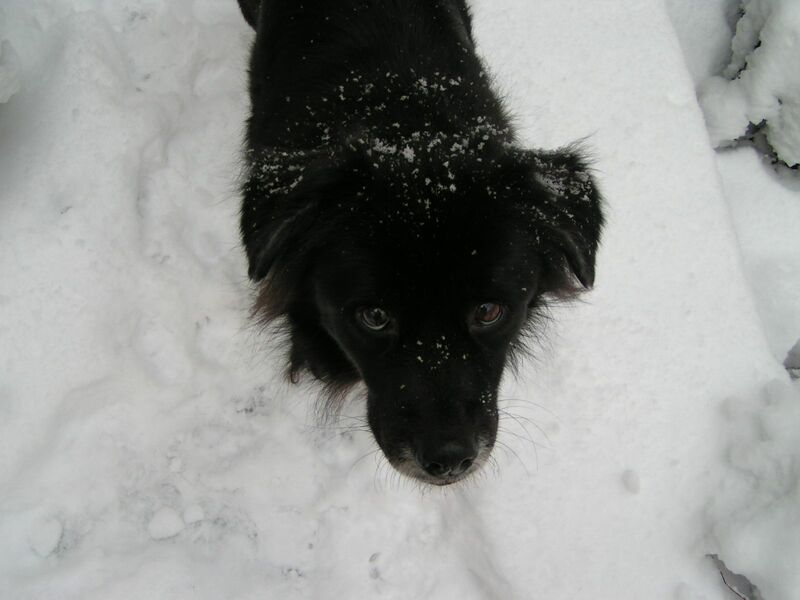 lynne – my dog is part border collie – and yea – she’s a maniac when it snows. the best is watching her brush it all up to her nose and bury her whole face in it! this morning she was pretty mellow though. it was a totally quiet peaceful walk and she occasionally romped. What a sweet puppy! Does she like the snow? If I ever need to be reminded of what pure joy looks like, all I need to do is watch my girls (a border collie rescue and a golden retriever) play and roll around in freshly fallen snow. It’s the best! 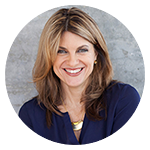 WOW…what a blessing! Thanks for sharing. We didn’t get any snow in eastern NC. Ima looks cold….love the surroundings, it’s just so peaceful and clean looking. Love this scene and LOVE her eyes!! Awww! Very pretty! I also love the sky in the background! Looks like you both were having lots of snow fun! I see you love the snow as much as I do! Our yard looks the same. 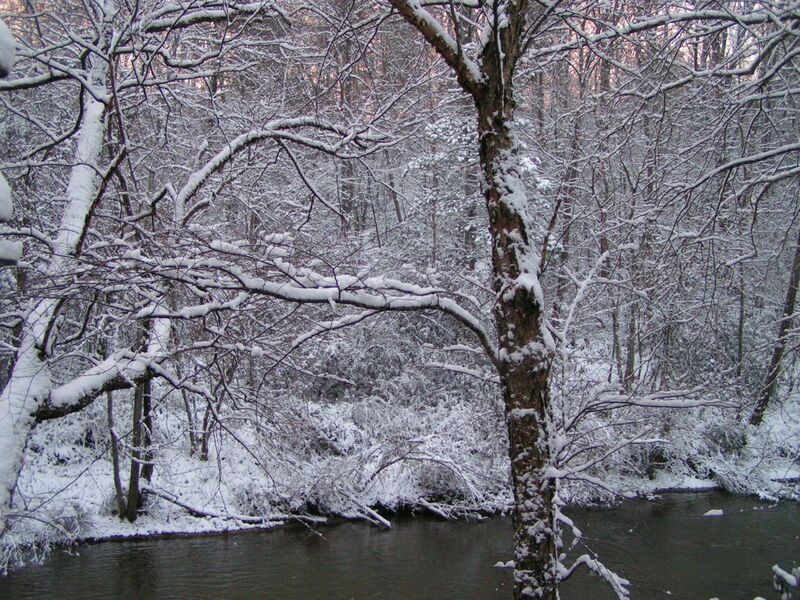 The woods are beautiful in the snow and the Swannanoa River couldn’t be much prettier. My dog Jack and I had such a fun walk this morning. Beautiful back yard you’ve got. I love snow and I feel lucky that I’ve woken up to many mornings like that… 🙂 Take care Christine!